Another fantastic result for the Vale and only some great saves from the home goalie stopped it from being more. Vale started the game in a similar fashion to Saturday with solid defending and the speed of the front two, Stewart and Rixon, giving the home backline problems. In the 5 min a cross ball found Stewart on the end of the box, although it was a close decision on whether it was slightly offside, Stewart controlled the ball and hammered an unstoppable shot passed Barclay. With the home side stunned by the first goal, they found themselves 2-0 down in 15 min when after some bad defending from a corner, Stewart hit another powerful shot past Barclay. Vale were coming under a bit of pressure but were defending well and looking comfortable. However, in 42 mins the home side pulled one back when after a very soft free kick outside the box, the resultant kick was headed home by Rogers. Vale started brightly after the break and were rewarded in the 50 min when after some good play Stewart made his way into the box and slotted home for his hat trick. With the home side on the offensive, Vale had a few great chances to finish the game and only some poor finishing and three excellent saves from Barclay stopped them increasing their lead. With Vale looking comfortable, the game changed in the 78 min when East Stirlingshire were awarded a penalty when Elliott was adjudged to have fouled a home forward. A shocking decision, which resulted in Rogers placing the ball past Gilpin. The last 10 minutes were edgy with Vale under pressure, however they held out for a really deserved victory. Two great victories in a row, and good to see some supporters from Innerleithen there tonight. 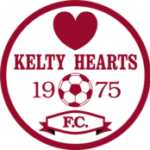 Hopefully we will have a good crowd on Saturday to back the boys, as it’s expected that Kelty Hearts will bring a big crowd through from Fife. Prior to the game Vale were reduced to a skeleton pool due to injuries and work commitments. 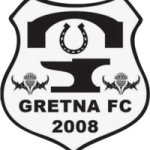 However, from the kick off it was clear that Vale had worked out that the Gretna backline were susceptible to a ball over the top or down the channels where the pace of Stewart and Rixon was creating constant problems for the Gretna defence. Vale opened the scoring in the 14 min when Rixon broke through the Gretna defence and slotted home. Vale increased the their lead in the 20 min when a similar move as the first goal was knocked home by Stewart. Gretna did rally after this and were rewarded when Kelly hammered home a cross from the left in the 27 min to make it 2-1. In the 39 min Vale were awarded a penalty when the Gretna goalie Atkinson bundled Stewart over. He was booked for this before Dickson fired the spot kick home. Vale increased their lead in 41 mins where Berry scored after a good move. Bonnar had to be replaced at half time due to a hamstring injury and was replaced by Elliot. The second half began as the first finished with Vale defending well and hitting with speed on the break. Gretna appeared to have no way of countering this approach and after another break into the box in 52 mins Stewart was upended again for the second penalty of the match. Dickson dispatched as the first to make it 5-1. In the 60 min were awarded a soft penalty when Smith was adjudged to have fouled one of the Gretna forwards. However, justice was done when Gilpin saved Connelly’s spot kick. Things got worse for Gretna in the 74 min when Stewart broke free and whilst rounding Atkinson, the goalie bundled him over for a third penalty, plus a second booking and sending off. The replacement goalie Waugh, first task was to pick the ball out of the net after Dickson had completed his hat trick. Vale squandered a few chances to increase the lead prior to full time, but can be pleased with the overall performance. Man of the Match as chosen by the Match Sponsor, Drew Johnson was Ally Smith. A great result for the team as we head into two very difficult games, East Stirlingshire away on Wednesday, followed by a home game against Kelty Hearts on Saturday. 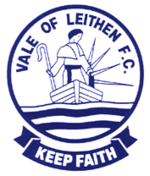 Saturday’s game against Kelty will be a first visit to Victoria Park, and they tend to bring a big support with them, so hopefully we can get a good crowd behind us.